Melissa and Scott Shields with his parents Will and Karen Shields. Open seven days a week, 11:30 a.m. to 10 p.m.
Scott’s parents, Will and Karen Shields, are co-owners and are actively involved in the operation. 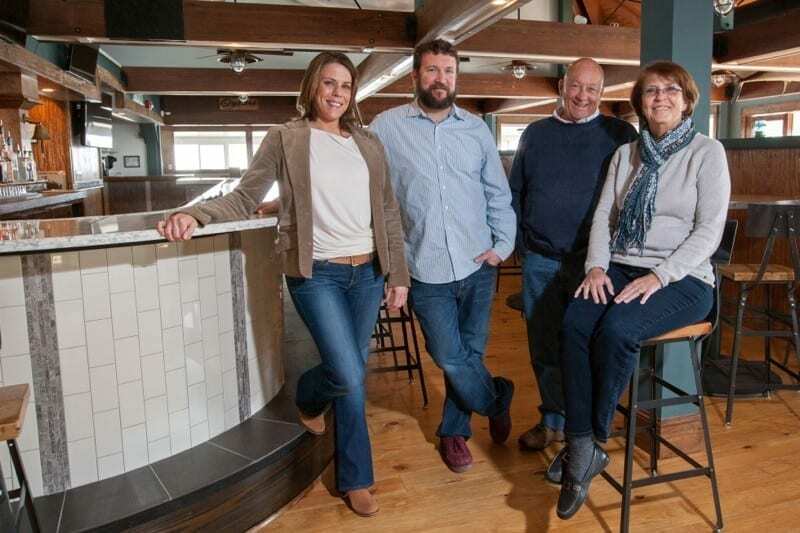 Scott’s sister Cara Godwin likewise is also on board as assistant general manager of both restaurants. Blue Water Grill takes full advantage of the location, with expansive views of the marina and sounds. Below, Mimi’s Tiki Hut, which the Shieldses opened in 2014 will continue seasonal operations offering outdoor, dockside libations and bar fare. Scott Shields may have been destined to be a restaurateur. Scott’s grandmother and his parents owned restaurants back in Pennsylvania. He began in the kitchen at a young age and has followed a natural progression from cook to chef to manager to restaurant entrepreneur. “I was managing my first restaurant at 15. My folks had to drive me to work,” he said a couple of days after a soft opening of Blue Water. With real-time food service experience under his belt, the young Shields attended IUP Culinary School of the Arts. On graduating he moved to the Outer Banks and joined the line at the venerable Owen’s restaurant in Nags Head. After three and a half years there he took a job running the Mill Street Grill in Staunton, Va. That nine-year stint lent valuable experience. Also building was the desire to realize his vision of the perfect restaurant experience. It was time to head back to the beach. Dining and bar areas are set apart but still seem open with the length of a partial wall and woodwork throughout. The Blue Moon, opened in a wee leasehold in 2009 grew and expanded at a steady pace as the crowds built and space in the center became available. With the mechanics of the operation at Blue Moon anchored with veteran pros in place, the young Shields was able to step back a bit from the kitchen. As a young father of a growing family, he was aware of the consuming nature of the restaurant world and vowed to run it, and not let it run him. “My kids are little, I am not missing this,” he says, grinning at his 6-year-old son on a nearby stool. Family is a word that comes up often in a conversation about their business interests. “It truly is a family enterprise. And sometimes the business plans have to accommodate family plans. It wasn’t long before a vision for the next big thing began to take shape. The family contemplated new construction for their next operation over two years ago. 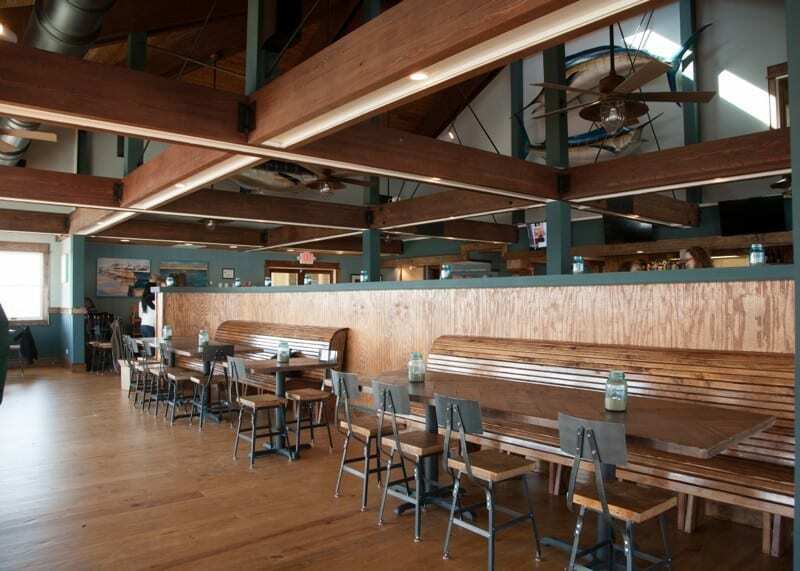 One thing led to another and the space at Pirate’s Cove, with a good dose of remodeling, seemed to be the perfect fit. Taking over Mimi’s Tiki Hut established a foothold. A variety of light sources, from inset spots in the overhead beams to the indirect lighting under the cap of the short wall to the candles in Ball jars, bring an excitement and intimacy to the setting. And you know you are in sport fishing heaven with replica trophy billfish in the open vaulted ceiling. We at the Voice were in attendance at the recent soft opening event. We can report the service was professional in every sense and the menu was enchanting. 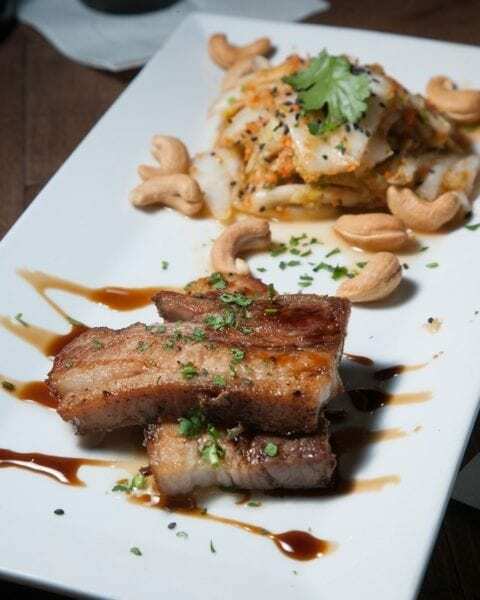 Pork belly, which is becoming a more common item, was whimsically set off here with kimchi, toasted cashews and a pomegranate molasses glaze and was a standout appetizer in a strong field. Likewise, a slight new shift on shrimp and grits was spot on with caramelized shrimp over organic grits, with bacon and a charred tomato broth under a plume of pickled onions. It was an excellent appetizer plated for sharing. One of the more intriguing entrées we have seen locally is the pastry-wrapped crab cake. Yes, a jumbo lump crab cake is shelled inside a puff pastry exterior. 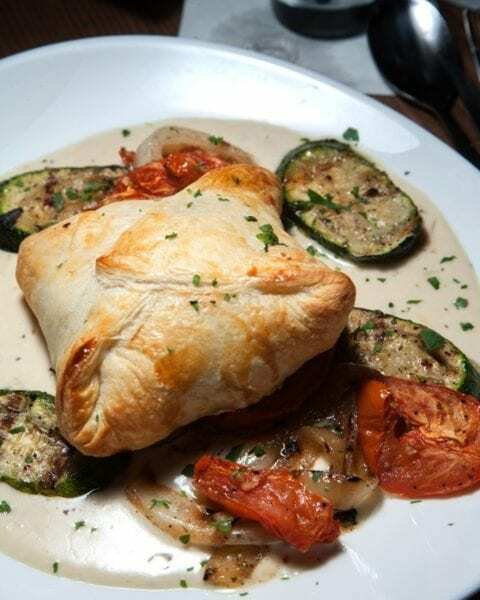 It was served with fire-roasted zucchini and roma tomatoes with a velvety preserved lemon beurre blanc. One could almost imagine this dish as the East Coast cousin to the Cajun crawfish pie. Not only was it decadently rich, the technique seemed to help the crab cake maintain its heat. This was a very good choice. Also outstanding in freshness, flavor and texture was the shrimp and lump crab cavatelli. Artichokes, basil and grape tomatoes created harmony with the supple shrimp and large lumps of blue crab in a lemon caper cream amid tender cavatelli pasta that resembles tiny hot dog buns. 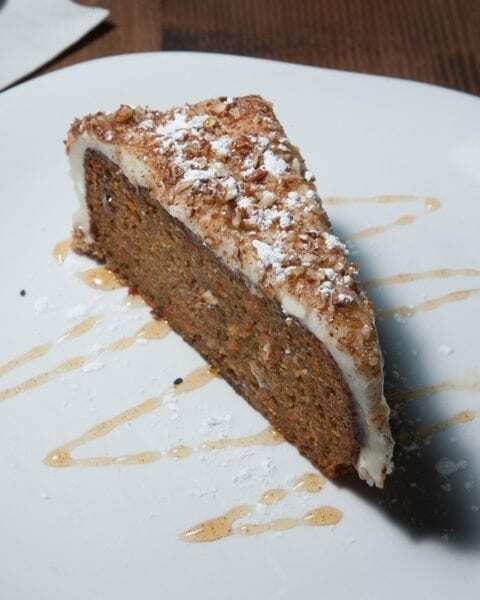 In the dessert category the table was wild about the Spiced Carrot Cake. Still the tops may have to be the blood orange creamsicle, a sweet and sour semifreddo with pistachio crust and a Cabernet-blood orange syrup that knocked the creamsicle-on-a-stick of our youth to wild party adulthood. The full ABC licensed bar commands the interior wall and separated the dining room from the kitchen. In addition to a short yet varied wine list, five signature cocktails are listed, as are a happy sampling of North Carolina and American craft beers. Two seatings were served and then surveyed. Not merely via a “pick one” rate card but a sheet with opening questions requesting real feedback. Such a gesture can be very useful for the staff and empowering for customers. While the new location may demand more of Scott’s presence, he’s confident in the success of both properties. Scott’s long time friend Eric Almarode is the kitchen manager at Blue Moon and worked with Scott there and in Staunton. 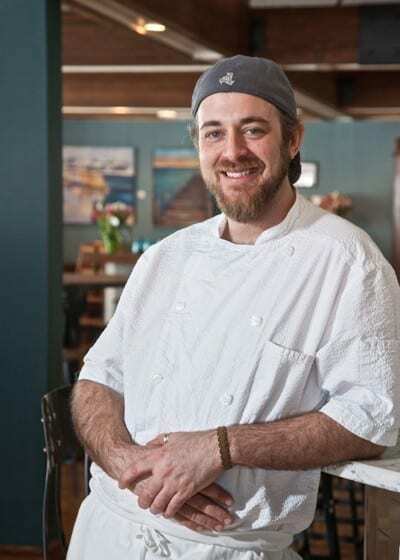 Evan Hayes is the head chef at Blue Water Grill. He began working at a very young age in his parent’s Upper Crust Bakery in Greenville, N.C. and went on to graduate from Johnson and Wales University in Norfolk, Virginia. He is also a Blue Moon alum. “Blue Moon is pretty well dialed in. We staffed it right. We aren’t going to let Blue Moon slip,” said Shields. The People’s Choice Exhibit, titled Watermarks’ will have a diverse selection of Edwards’ mixed media, photography, and paintings. Edwards says she also hopes to include a projection/film from her thesis exhibition.